A good setting allows the potential for many different stories, otherwise we’d just be writing a single scenario, a railroaded campaign, or even a novel. In a live game, we often need many different interconnected stories occurring at the same time, and when the players are able to direct the stories for their characters that often leads to a divergence of story types. Some stories may revolve around politics or trade, others might lead to travel, exploration, or confronting the potential horrors of the setting. What I’ve defined so far would be more than adequate worldbuilding if the setting was being used to tell stores of intrigue and the relationships of people in a land on the brink of revolution, but it doesn’t really describe the potential eldritch horror, mythic exploration, and arcane mystery that I also saw inherent in the narrative. What else do we need? Let’s break it down. Worldbuilding 101 - Part 21: It's the End of the World as We Know it. The End Game is something that all campaigns need. I’ve seen more games fizzle out because there just wasn’t enough drive to keep them going, but there were a few core players who just wouldn’t let them die. Every character in a setting has their own story, but the setting itself also has a story. A great example of this is the ballsy thing that White Wolf did in around 2002-2004, where they said that since the World of Darkness was the story of a decaying world in the final death spasms before apocalypse, they’d just write a series of books to conclude the game line. I didn’t like it at the time, because some of my favourite games were seeing a conclusion, but I respect the decision to end things on a high. It’s a bit like the re-iteration of D&D versions. A new set of rules comes out and the existing settings either get a reboot or disappear completely (maybe returning when a new version appears a few years down the track). If scenes are words, short term goals are commas, medium term goals and full-stops (or periods for our American audience), and long term goals are paragraph breaks. I like to inject short term goals into a story to alter the flow and pacing of things, while medium term goals signify a new pattern of thought complicating and transforming the narrative, and long term goals are conclusions. I also like to make sure at least half of my goals are generated from the players. In a small game, I might have more control over the destiny of things, in a large game I let the players do most of the work because otherwise I’d burn myself out. Player-inspired short term goals are derived from individual character backgrounds, they play out after a set timeframe or once at least a quarter of the players have a vested interest (one way or the other) in the outcome. I think we’ve got a pretty good grasp on the way the world looks, the cultures that make it up and the kinds of specific people who belong to those cultures. To use a theatrical analogy, we’ve set the stage, we’ve established the supporting cast and even some of the secondary characters, costuming and make-up are taken care of. We don’t have a plot (of course arguably, the whole point of a roleplaying game is about developing the plot and narrative), but we do have a few motivations for our characters. Some recent roleplaying games would state that this is more than enough world-building to get the story happening. There are relationship maps for the players to interact with if they choose to indulge in a “character-driven” narrative, but for players who want a “plot-driven” narrative or an old-school game, there is probably a bit more work to do. One of the things I’ve learnt from years (actually decades) of LARPing is that people who get involved in this sort of thing love to dress up. Costuming is a part of it (and we looked at the various cultural costumes in this world in the last post), but so is make-up and quite often prosthetics and latex masks. In order to know what type of make-up would be used to portray our characters, we need to get a few racial trait descriptions. It probably makes best sense to connect these to the genetic traits linked with each race. Since we’re playing the game in a live context with regular humans portraying the roles, it also makes sense for the baseline racial appearance to be simply human. Nullans (No special abilities) Therefore they look like regular humans. Regarding yesterday’s post. It appears that there might be some kind of disconnect between the setting and the system, and that’s something that can prove detrimental to good storytelling. This worldbuilding exercise is a follow on from my last series on designing a “Boffer LARP system”, but boffer LARPs are all about hitting one another with padded weapons, and I’ve just mentioned the presence of firearms (which are a distincty non-boffer trait). It’s actually not as much of a disconnect as it seems at first. For one thing, this is a steampunk/pirate Boffer LARP, there will be cutlasses and rapiers and swashbuckling, but there will also be muskets, flintlocks, and single shot rifles. The idea of the game was inspired by the notion of a boffer LARP with “Nerf” guns. But I guess that needs us to clarify the technology level a bit more. Before we get into what the characters actually look like, let’s consider technology. At this stage, we could apply a wide range of technology levels to the setting. It seems pretty obvious that we’d be looking at 16th to 18th century levels, post renaissance – pre industrialisation; after all, there are pirates and privateers, concepts such as democracy, and we’ve mentioned steampunk as well. But the developmental concepts used so far could just as easily be applied to an ancient world setting, modern era, sci-fi…we could even apply one of these technology levels to the current game, and just maintain the “aesthetic of steampunk” like so many other games on the market. Here's a new update on the island map. I'm not sure if I'll go further with this, I don't want it to end up looking too busy. But if I do add more detail it will include naming the towns on the main island map, and maybe adding the names for a few more points of interest (and adjusting the colouring). 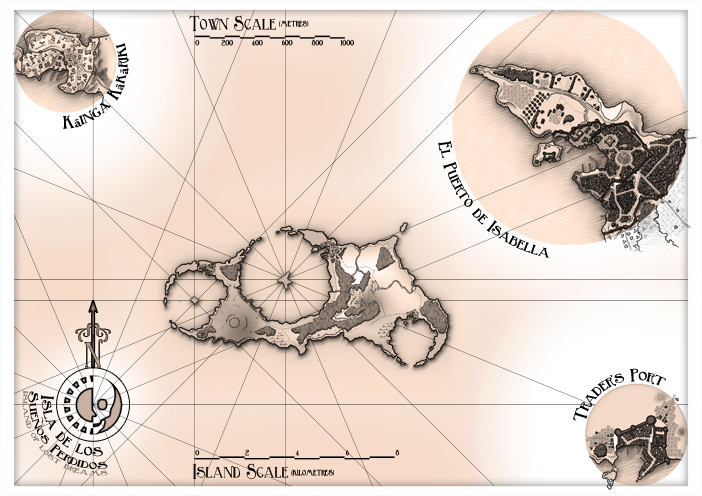 Next a wider map of the archipelago, once we've decided to expand the scope of the setting a bit further. So that’s lead me back to races in this setting. Races don’t need to be a part of fantasy worldbuilding. Take Game of Thrones, where everyone is basically human (except for those giants north of the wall, and a few other notable exceptions). I even neutralised the notion in the setting of my Goblin Tarot deck by making every race in the labyrinth a variant of a highly mutagenic core goblin race. The final parts of the cultural details are the various power structures used by each group. Overall, the power structure of a setting is typically defined by the power structure of the dominant group, in this case it’s the aristocracy of the Empire of the Sun. In order to avoid a major conflict with this dominant group, other cultures pay lip service to the Empire’s aristocracy (at worst), and in some cases follow it fanatically (at best); but most people just let the empire deal with their own matters while living their lives according to their own cultural values. As long as the empire doesn’t demand too much of them and provides protection, the colonial folks and privateers are happy to pay their taxes, those who don’t like it move away to Trader’s Port, go native, or quietly plot rebellion in the shadows. Worldbuilding 101 - Part 3: What's in a name?